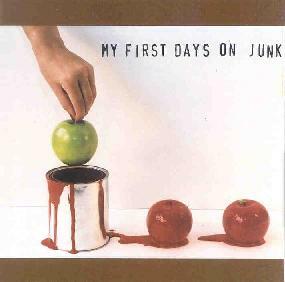 My First Days On Junk - "Songs For Darla The Fake Girl"
There was a time, way back in the early 90’s, when the whole alternate/college/indie rock scene had a lot of good bands, that played pretty accessible music that was also interesting to listen to. Y’know, Yo La Tengo, The Vaselines, Galaxie 500, some of the early Simple Machines and TeenBeat stuff. I don’t know if that has changed, or if I have just gotten older or stopped paying attention, but I don’t hear that kind of music too often anymore, which makes My First Days on Junk a pleasant surprise. The first half of the disc is catchy with nice coed vox and layers of acoustic and fuzzed out electric guitars. They even get in touch with their inner Kevin Shields on the back to back pair "Getting Through To Someone New/From a Parked Car". As they head for the end they get folky-mellow ("How Do I Tell If You’ve Gone Too Far", "Forever"). Sure it’s a bit influenced, but hey, they are my influences! If they are yours, you will probably dig this also. The quality of the songwriting is really what makes this type of music, and these folks do it well. Visit the Dangerfive web site at: http://www.dangerfive.com.